Nov 4, 2012: Bella Dorato at the Fasig-Tipton sales barn. This lovely mare is Bella Dorato, the dam of 2012 Champion Sprinter Trinniberg. 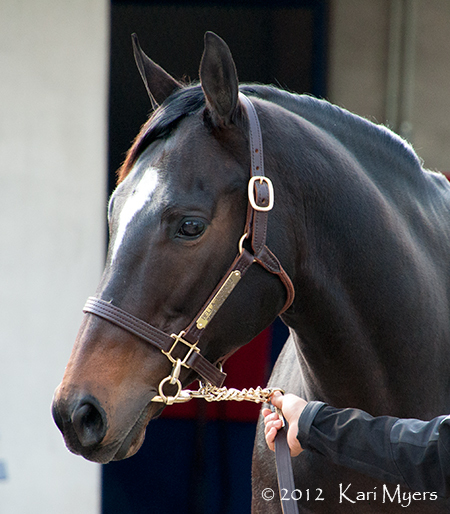 She’s shown here at the 2012 Fasig-Tipton November sale, just before she sold to Stonestreet for $460,000. She stood out to me even before I knew who she was because she bounced and danced everywhere she went. I don’t know if that’s just her personality or if she was on her toes because of the constant flow of people through the sales barns, but she had quite a spring to her step. Trinniberg has retired to Rockridge Stud in Hudson, NY after a rather lackluster year, but he was always one of my favorites on the track. Here’s hoping that he passes on the good looks and speed that mama Bella gave him! 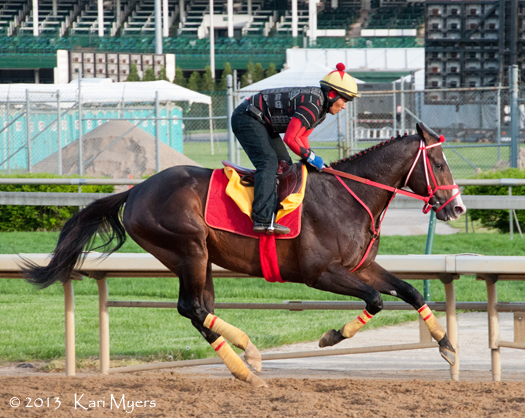 May 2, 2013: Trinniberg gallops at Churchill Downs a few mornings before his start in the Grade 2 Churchill Downs Stakes. I’ve always liked Trinniberg. Maybe it’s because I followed his sire Teuflesberg so closely and was heartbroken when he was injured and forced to retire. You never know how those things will turn out, but Trinniberg has become quite an accomplished sprinter for his sire over the last two years. I got a look at his dam, Bella Dorato, at the Fasig-Tipton November Sale in 2012, and she was a big, beautiful handful. I never saw her stand still for more than 2 seconds. Trinniberg helped set the pace in the 2012 Kentucky Derby, but faded to finish 17th. The mile and one quarter was a little bit too far for him, so they shortened him up to seven furlongs and he won the Grade 2 Woody Stephens next time out. He finished 2012 by winning the Breeders’ Cup Sprint over a nice field and being named the Eclipse Champion Male Sprinter. You can’t miss Trinniberg on the track; he is always sporting the Parbhoo’s bright red and yellow tack, along with a little red pom pom in his forelock. I’ve seen him run a few times since 2011, and it looks to me like he’s carrying a lot more weight and muscle this year. He’s had two poor races in 2013, one in Dubai and one in the slop on the Kentucky Derby undercard, so I hope he’ll bounce back to form once he’s back on a normal (hopefully DRY) track. Go go Trinniberg and his little red pom pom! 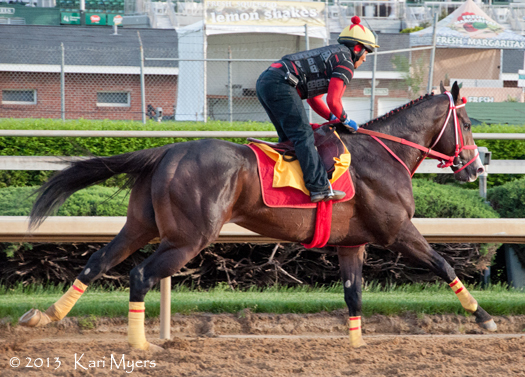 May 2, 2013: Trinniberg gallops at Churchill Downs. 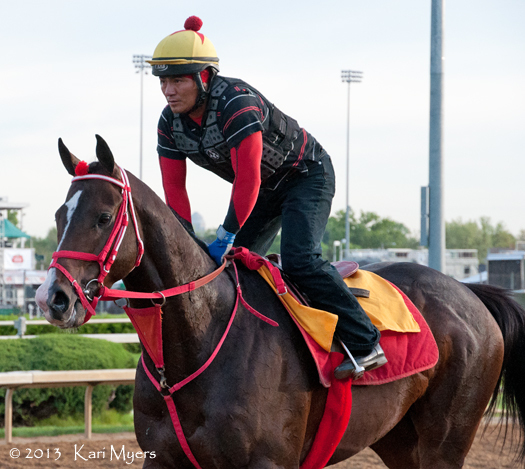 May 2, 2013: Trinniberg and his pom pom head back to the barn after a morning gallop.